The interiors of the bathroom reflect your attitude and influence your mood. If you are looking to upgrade your bathroom or renovate the same, consider installing a shower glass enclosure. Frameless glass shower doors are great for bathrooms since they require minimum maintenance and allow more light to come in while showering. Shower enclosures come in a variety of size, shape, style, and color to fit virtually any bathroom. While few shower enclosures are easy to install, some might demand professional installation. Corner Shower kit: This is the most popular and one of the highest selling shower kits in the market. Corner shower kits occupy less space and yet provide an elegant and spacious area for showering. An ideal deal for smaller bathrooms, corner shower kits come in a variety of styles. This includes corner kits with double doors opening away from each other or a single door pivoting outwards. Sliding door features are also available for bathrooms with limited space. Stand Alone, Two or Three Sided: Stand-alone is yet another popular shower kit mostly preferred for its luxurious appearance. This four-sided glass enclosure, which is generally fitted in the central area of the bathroom, allows one to be highly creative. However, stand-alone kits are not for all bathrooms as they require more space. While two or three sided is ideal for all bathrooms, they can be custom designed to suit your need and bathroom size. Shower curtains have been used to keep out the way from the non-shower area of the bathroom. But glass shower doors are more elegant and efficient. Choose from a variety of shower doors to suit your bathroom layout and budget. These include pivoted opening, sliding doors, swinging doors or bi-fold doors. While choosing shower doors, give some thought as to where the towel bar should be fixed. Few doors come with integrated towel bars while many require custom placement. Sliding doors : The most common glass shower door that occupies less space. However, cleaning the rails might be little difficult. In addition, the rollers may wear out over time and require replacement. However, purchasing a quality unit can be helpful for a while. Moreover, most sliding doors are mounted over bathtubs because of the length of the opening. This provides restricted access to the bathtub thus making it difficult to clean certain areas because they overlap when closed. Bi-Fold / Curved Doors: Bi-fold doors are ideal when the opening is narrow. 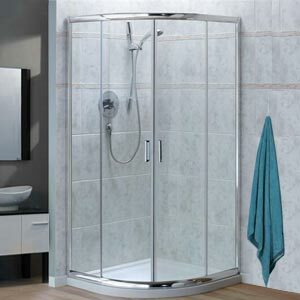 The doors are designed in a way such that they use minimal space thus providing full access to the shower area. The major disadvantage of bi-fold doors is the bottom, which might get jammed and the tracks tend to collect oil and dirt that are difficult to clean. Curved shower doors are perfect for corner installations. Like bi fold doors, they provide spacious showering areas. The curved doors come with a curved glass panel attached to a frame at both top and bottom for stability and smooth operation. The door is reversible for right or left access. Swinging doors: These are suited for large and spacious bathrooms or shower enclosures. The doors can be made as wide as 48 inch depending on your bathroom or shower layout. While installing, ensure that the door does not swing into towel bars, washbasin, doorknobs or other barriers that might present a hazard. These doors can either be hinge-mounted or pivoted with the help of magnetic catches. The hinges can be single action or double action depending on your need. Generally, a double-action hinged frameless door can swing either ways. Framed / Frameless doors: Aluminum rods are generally used for framed doors. In frameless doors, the handles and hinges are directly mounted through the glass instead of being attached to the frames. Frameless doors add elegance to shower enclosure. They make the shower area appear larger, more open and are easy to clean as well. Frameless doors are the best when fitted with clear glass. Frameless doors are usually made of heavier glass since they lack the protection of metal framework. Though the glass being used is considered fragile, it is actually very strong on the edge. Thick tempered glass is extremely durable and difficult to break. Even if it breaks, the tempering process lets the glass break into tiny pieces, thus reducing the risk of injury. Frames are generally made of anodized, extruded aluminum that are later coated with a dye. Frames come in a variety of colors to match any decor. The color can fade over time if exposed to ultraviolet light or to harsh cleaning chemicals. Custom / Specialized doors: You can be as creative as you want when choosing shower doors. In general, shower doors are made of any height, width and configuration. A number of matching accessories are also available for most units. Glass Options: Apart from clear and opaque, a variety of reflective choice patterns are available in the market. The most popular pattern is obscure though fluted, etched and beveled are also preferred by many. Be creative in choosing the glass for your shower. Remember, clear or opaque glass is difficult to clean and maintain. Given a wide array of options, choosing a glass shower enclosure may sound difficult. However, it is actually fun and creative. Take considerable amount of time to think how your glass enclosure should be, which door is right for your bathroom layout, what kind of showering system is needed and above all what is your budget. Deciding on a budget can help you narrow your selection. Also, measure your bathroom area where the shower enclosure needs to be installed. This can help you narrow your selection down further. Take cues from your existing bathroom. If you have a brass finish, continue the same with shower enclosures. If you have a modern bathroom, try finding the one that would complement the existing layout. Finally think about the doors and their opening. Shower glass enclosures can also be theme based. Be as creative as you could be in designing or deciding your shower bath enclosure as they reflect your mind and mood. First Published Date: 31 Jul 2009 Last modified Date: April 18 2019 This page may have been updated recently as new information is available or the content may have been edited for better readability.